Groundbreaking case design, you guys. Mock-ups of a case said to be made for the iPhone 5 have hit the internet. If these are indeed cases made for the new Apple handset, the iPhone 5's design seems to vary very little from that of the iPhone 4. 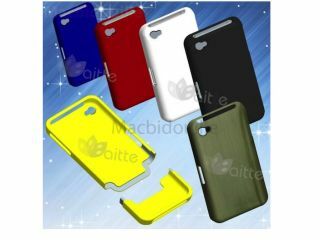 The blog that originally posted the images, Hardmac, reports that these cases "would be prototypes of the iPhone 5 cases, based on the mockup that was provided by Apple." By the sounds of things, Hardmac's source hasn't actually confirmed that these designs are based on a mock-up provided by Apple, but did tell the site that these are cases for the iPhone 5. If that's the case, the iPhone 5's shape, button placement, camera, flash and SIM card slot remain unchanged from the 2010 model. The only thing that is for sure is that whoever this case manufacturer is hasn't exactly been hard at it. We could have designed these cases in our sleep with our left hands while shackled to a charging rhinoceros.